is anyone else here a big Morgan Freeman fan? do you have favourite films of his? I have seen many a MF film ! Bucket List was a hoot ! I liked MF in Outbreak and he was great in Driving Miss Daisy (my fave). Oh yes, Lean On Me. Great MF film!! Watch a movie called 'The Magic of Belle Isle' one of Freeman's best performances. Jerome Wrote: Watch a movie called 'The Magic of Belle Isle' one of Freeman's best performances. as shown in the OP Jerome....superb movie! CRAZY-HORSE Wrote: as shown in the OP Jerome....superb movie! Oops - sorry - I missed that one! From the acclaimed director of CASANOVA, CHOCOLAT, and THE CIDER HOUSE RULES ... Academy Award® winners Robert Redford (Best Director, ORDINARY PEOPLE, 1980) and Morgan Freeman (Best Supporting Actor, MILLION DOLLAR BABY, 2004) star in this powerful story of risk and redemption. 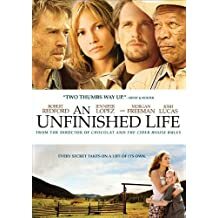 Stoic and heartbroken, Einar Gilkyson (Redford) quietly lives in the rugged Wyoming ranchlands alongside his only trusted friend, Mitch Bradley (Freeman). Then, suddenly, the woman he blames for the death of his only son arrives at his door broke, desperate, and with a granddaughter he's never known. But even as buried anger and accusations resurface, the way is opened for unexpected connection, adventure, and forgiveness. Also starring Jennifer Lopez (SHALL WE DANCE?) and Josh Lucas (SWEET HOME ALABAMA, GLORY ROAD).